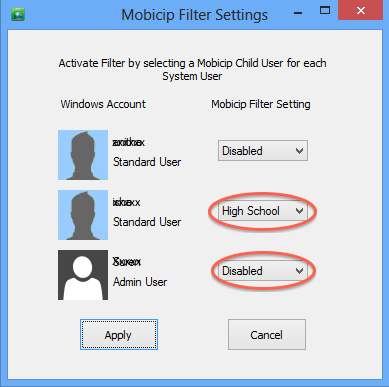 Mobicip supports the notion of a 'user profile' or a 'filter profile'. Essentially, it allows you to capture the filtering settings for a single user (or group of users in case of a school or enterprise), and apply it across a number of devices. A filter profile can be setup at one of 4 default levels - Strict, Moderate, Mature or Monitor (learn more). The default filtering level for a profile can be changed at any time (learn more). Premium users may customize the filtering profile after selecting one of the default levels. Now, let us see how the filtering profiles in your account can be mapped to actual devices. Mobile devices like iOS or Android-based smartphones and tablets are typically not shared and do not support the notion of user accounts, like your Windows PC or Mac for instance. It is assumed that there is only one active user on the device at a given time. To change the user profile, you will need to go into the Mobicip Safe Browser settings. A Windows PC supports the notion of user accounts. The user accounts can be mapped directly to your Mobicip user profiles. For instance, an adult user could have an account mapped to a user profile set at the 'Monitor' level, while an pre-teen user's account can be mapped to restricted user profile at the 'Moderate' level.